I’m so amazed and impressed that democracy is thriving in Thailand. 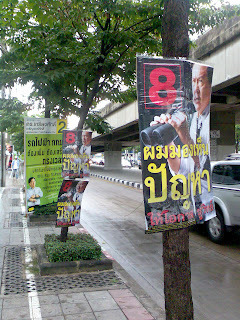 Bangkok will have a governor election in October 2008. The people in this city have the chance to choose who they would like to be the head of the city. From my understanding, Bangkok is the only city in Thailand that has an elected governor by the people. There are 9 candidates in the running for the new governor of Bangkok. One of them is a female, Ms Leena Junjanya ! One of them is the previous governor hoping to be re-elected. Bangkok is a colourful city. Everything is so colourful in this city, including the posters of Bangkok governor election 2008. . On the posters, we can see a big picture of the candidate. Pictures of the candidates are not boring portrait. They are actually posing in front of the cameras! 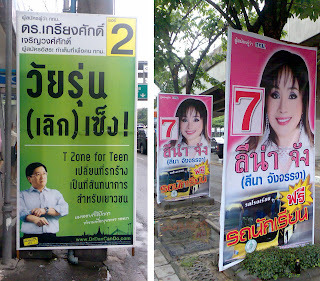 The number shown on the posters is his or her candidacy number. There is no sign of the parties they representing on the posters. As you may notice, some of the posters are actually graphically designed. Each candidate’s posters have a colour scheme. For example, posters of the previous mayor, Mr. Apirak Kosayodhin, use blue, green and white. Ms Leena Junjanya uses pink on her posters (to match her make-up?? Haha) On the posters, some show pictures of what the candidate will do if he or she is elected. These posters are not like the boring election posters that I saw in other parts of the world. In Malaysia, the posters or banners only have parties’ logo or slogans. But here, they are more interesting to be looked at. 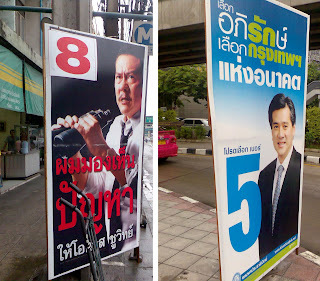 I think only Bangkok has such interesting election posters. Here are some examples that I took pictures of. Enjoy. hahaha... no. 8 is funny, isn't it? His posters have 2 or 3 designs, but i don't know the meaning of it. Perhaps he is trying to beat up the bad guys.